The Information Table is the dynamic crossroads for all activities in the Beast Crawl Festival. 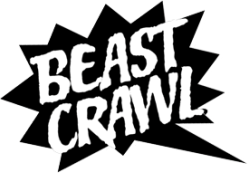 Any and all information regarding the Beast Crawl Festival can be found here on the day of the event. Show up early, pick up a map, buy a t-shirt, ask questions, and interact with poets and writers about to take the stage at one of Uptown Oakland's amazing venues. Just look for our blue and green banner on the day of the crawl. We'll be available from 4PM until 8:30PM to answer all your questions or point you in the right direction, which is wherever you want to go! Our volunteers will also be available to help you plan your route through the various events of the festival. You can always find them at the Information Table as well as at each event throughout the night. You can clearly identify them by the volunteer logo (shown left) they will be displaying. Maybe you're also interested in joining the Volunteer Corps? Email Us.